What a delight this book is! It mixes a childlike wonder with generous sprinklings of adult irony that avoid breaking the spell. Elise is missing her mother, a busy architect who is far away in another country busy with a large project. Her father, a musician, is kindly but busy with busking and performing at weddings. Desperate for company, Elise yearns for a dog. Dad resists. But not for long. 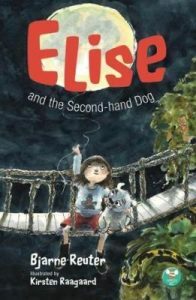 Elise names her dog Prince Valiant, but he maintains he already has a name – McAduddi – and that he hails from Tobermory in Scotland. It turns out that he has a penchant for singing sea shanties about Highland Park malt whisky. The book will be a strong contender for ACHUKA’s Book fo the Month slot, when it is published in April.